CMS Commander helps you easily keep track of the backlinks for all your WordPress sites. The stats are displayed directly on your dashboard and allow you to see how many links point to each of your sites as well as historic changes and much more. Why keep track of the backlinks to your WordPress blogs? While many SEO’s think that social metrics get more and more important no one is denying that backlinks are still one of the most important metric for your site. They help you get ranked in search engines and get direct traffic from people who click on the links. CMS Commander helps you stay on top of your backlink counts by displaying clear link statistics for each of your managed sites. Which details can I see about my backlinks in CMS Commander? Total number of backlinks – the accumulated number of links pointing to your site. Number of nofollow backlinks – helps you keep track of how many backlinks to your blog use the “nofollow” tag. Number of links from different domains – having more backlinks from different sites is better for SEO. Number of new links – compared to the last backlink check. How do I track links for my WordPress sites in CMS Commander? The backlink tracking feature in CMS Commander is fully automatic. That means you do not need to do anything other than add your sites to your account. CMS Commander will check your links the moment you first add your site and then automatically update the statistics every 2 weeks afterwards. Where does the backlink data in CMS Commander come from? 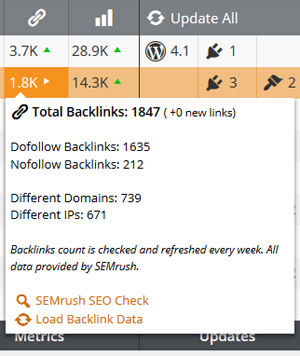 All backlink data and stats in CMS Commander are provided by SEMrush.com, one of the leading link tracking and marketing research tools on the internet. Their link database is updated regularly and contains millions of relevant results.